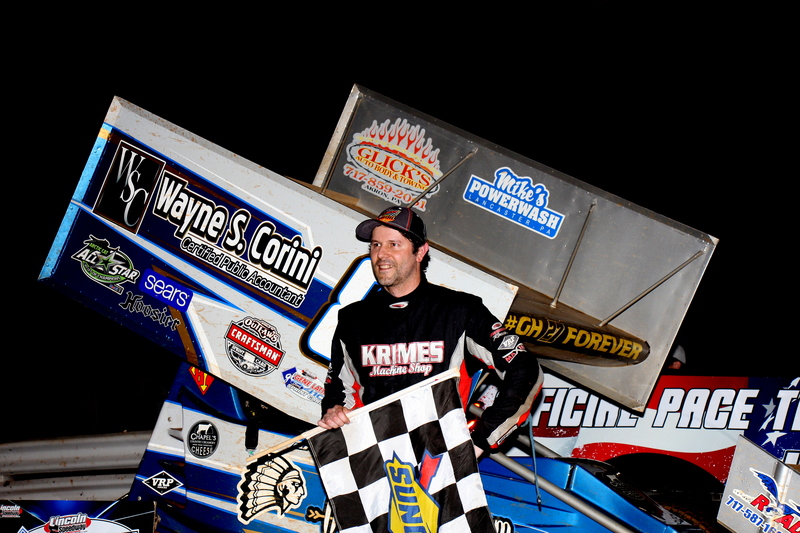 Abbottstown, PA (April 13, 2019) – Alan Krimes ended a two-year drought from victory lane earlier this year. On Saturday Krimes was back in victory lane, this time after a much shorter hiatus, to earn his 20th career win at Lincoln Speedway. For the second week in a row Cole Young started on the front row of the feature, but this week it was the pole. Brett Michalski shared the front row with Young. Young went to the top of the track at the start which let Michalski get his nose under Young going into turns 1 and 2. Michalski was about to lead lap 1 when the caution came out for Chad Trout who got turned around in turns 3 and 4. The caution set the field up for a complete restart. Michalski got his nose under Young again on the restart but this time Young got a good run coming out of turn 2 to give him the edge over Michalski going down the back stretch to lead lap 1. Chase Dietz, Brent Shearer and Krimes were waging a three-way battle for third place. Dietz emerged the victor and started to work on Michalski for second. It didn’t take long for Krimes to join in and once he did, he made quick work of Dietz and Michalski in two laps to take second. While Krimes was working his way through the front of the field Adam Wilt was doing the same and had just moved into fourth when the red flag came out on lap 11. The race leader, Young, hit the front stretch wall and flipped ending his night. Krimes inherited the lead and led Dietz, Wilt, Michalski and Brian Montieth to the cone for the single file restart. Monteith, true to his nick name “The Edge” went to the top of the track in turns 1 and 2 on the restart and got around Michalski for fourth. Wilt got under Dietz in 1 and 2 for second and they stayed side by side with Wilt edging Dietz at the flag stand by half a car length for the position on lap 14. With Krimes approaching lapped traffic, Wilt was able to close the gap between him and the leader. Once the leaders were in lapped traffic Wilt was able to keep pace with Krimes. Wilt gave it one last shot trying the bottom in turns 1 and 2 but he couldn’t catch Krimes. Krimes beat Wilt to the checkered flag by .772 seconds. Montieth held onto third. Dietz finished fourth and Michalski completed the top five. 410 Sprint Car heat winners were Cole Young, Dan Shetler and Brent Shearer. Kenny Kuhn started on the pole of the 20-lap feature with Austin Treuchet on the outside of row 1. Both Kuhn and Treuchet were chasing their first career win at Lincoln Speedway. Seventh-place starter, Doug Hammaker, was chasing his 10th career win at the track. Kuhn got out to the lead on the start but there was contact throughout the field which resulted in Tyler Walton coming to a stop on the front stretch, bringing out the caution. The field lined up for a complete restart with Kuhn getting out to the lead once again. This time Treuchet was on his bumper trying to take the lead. While Kuhn and Treuchet were battling for the lead, Hammaker started to make his way through the field. By lap 4 Hammaker was up to fourth. Hammaker then went to work on Alyson Dietz for third. Hammaker tried to the outside of Dietz in turns 1 and 2 but both drivers were running the same line coming out of turn 2. Hammaker got under Dietz going into turn 3 and had the position as they came out of turn 3. Once he was settled into third, Hammaker started to reel in the leaders. The caution came out on lap 9 for Brett Strickler who got turned around in turn 2. The leaders came to the restart cone nose to tail with Hammaker all over Treuchet. Hammaker pulled off a slide job in turns 1 and 2 for second when the caution came out again on lap 10 for DJ Montgomery when he got turned around in turn 4. Montgomery rejoined the field. Kuhn got a great jump on the field at the cone. Hammaker went to the outside of Treuchet in turns 1 and 2 to take second. Hammaker tried the outside of turns 1 and 2 to get around Kuhn but couldn’t take the spot. The red flag came out on lap 15 for Wyatt Hinkle who flipped in turns 1 and 2. Zach Allman was also involved. With five laps to go the field lined up for a single file restart. Hammaker went to the high side of the track going into turn 1 on the restart and had the lead over Kuhn coming out of turn 4. While Hammaker was taking the lead, Dietz was battling Treuchet for third and Jeff Halligan and Tyler Ross were racing hard for fifth. The white and yellow flags came out at the same time when Troy Wagaman Jr. got turned around in turn 4, leading to a green then checkered flag finish. Hammaker held onto the lead on the final lap to earn his 10th career win at the speedway. Kuhn crossed the line second and Treuchet held onto third. Ross made a last lap pass for fourth and Dietz finished fifth. 358 Sprint heats were won by Tyler Walton, Chris Frank and Travis Scott. With their scheduled season opener at Williams Grove falling victim to Mother Nature, the USAC East Coast Sprint Cars started their 2019 season at Lincoln Speedway on Saturday. Last year’s series champion, Steve Drevicki, started on the pole with Carmen Perigo to hisoutside. Drevicki got out to the lead and never looked back though there was plenty of racing throughout the field behind him. The caution flag came out on lap 1 for Matt Boland who got sideways in turn 2. Boland rejoined the field. Drevicki led the field to the restart cone for a single-file restart. Three cars got together on lap 3 in turns 3 and 4 to bring out the caution. Mark Bitner, Ryan Quackenbush and Matt Boland were the cars involved. Drevicki paced the field once again for the single-file restart with Perigo, Eric Jennings, Eddie Strada and Trey Hivner in tow. Strada, Perigo and Jennings had a three-way battle second with Perigo holding onto the spot. Strada moved up to third on lap 7 and then went to work on Perigo for second. As Strada and Perigo battled for second Drevicki was pulling away from the rest of the field. Strada got by Perigo for second on lap 10 by beating him to the flag stand by the nose of his car. Lapped traffic didn’t slow Drevicki down and he beat Strada to the checkered flag by 6.328 seconds. Perigo crossed the line third, Chris Allen Jr. finished fourth and Chandler Leiby completed the top five. USAC East Coast Wingless Sprint Cars heat winners were Chandler Leiby and Eric Jennings. Next Saturday, April 20, Lincoln Speedway is back in action with $6,900 to win 16th Annual Weldon Sterner Memorial and Spring Championship for the 410 Sprint Cars plus 358 Sprint Cars and Central PA Legends. Racing starts at 7PM with pit gates opening at 4:30PM and grandstand gates opening at 5PM. To get all the latest news, results, schedule changes and rule changes, visit Lincoln Speedway’s website at http://www.lincolnspeedway.com to stay up-to-date on all the action or pending weather conditions at Central Pennsylvania’s “Premier” Saturday night race track – The Fabulous Lincoln Speedway. 3 FEATURES WITH 3 LAST LAP PASSES; Wins go to Rahmer, Wagaman Jr. & Brian Jr.